Jodi Stemler Consulting’s first project in 2005 was serving as the initiative manager for the Theodore Roosevelt Conservation Partnership’s Marine Conservation Initiative. Jodi coordinated a coalition of sportfishing groups – the Angling 4 Oceans coalition – to develop policy priorities and to encourage those policies be included in reauthorization of the Magnuson-Stevens Act. 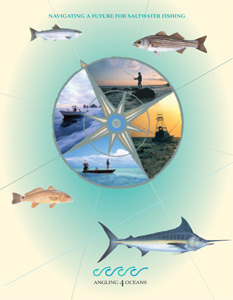 Those priorities were documented in the coalition’s Angling4Oceans Report that Jodi wrote, edited, and managed design and production for. In addition, Jodi organized a marine fishing media summit in Destin, Florida to provide sportfishing writers the opportunity to learn about the coalition’s policy recommendations. Most of the recommendations of the coalition were included when Congress reauthorized the Magnuson-Stevens Act in 2006.